Nigahotel is located in Azzano Mella, on the outskirts south of Brescia, a few minutes from the motorway exit Brescia Ovest of the A4 or exit Brescia Sud of A21, on the main road for Quinzano d’Oglio, in a quiet and easily reachable area, immersed in the green countryside of Brescia. 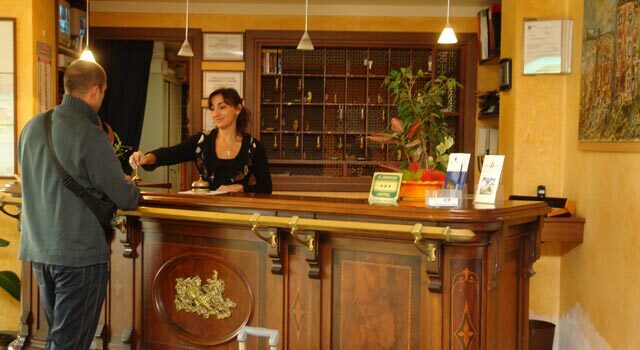 Nigahotel is a special place where you will find the courtesy and professionalism of the best Italian hotel tradition, with its ancient and proven philosophy ‘at the hotel like at home’, offering a warm, cosy atmosphere and equipped with all comforts to make you feel at home. The rooms are spacious and comfortable, furnished in a modern and functional style, equipped with all comforts such as private bathroom, direct dial telephone service, radio and LCD big screen ,satellite TV and pay- per view TV, minibar, air conditioning, safe deposit box, Wi-Fi internet and heating. The two restaurants serve international dishes, without forgetting the tradition of the typical cooking of Brescia and the bar has a wide selection of drinks and beverages. The staff welcomes you in a young and dynamic atmosphere, always ready to meet all your needs. Nigahotel is the ideal choice for businessmen, families and an ideal starting point for all those who want to explore the magnificent territory of Brescia.